You've heard about it on TV, you've read about it in the papers, and you've seen it on the internet. NOW, come and visit it!We are the destination in Calgary for local and international visitors to come to for their shopping and entertainment needs. This site has received over 23 million hits since 2004 making it an instant success story around the world as people search for what’s new on The Red Mile. We currently are ranked #1 in the yahoo search engine, usually #4 in Google, and in the Top 100 searches on SearchCalgary.ca. With hundreds of local area merchants, our world-famous Calgary hospitality, and a unique mix of historic and modern buildings, The Red Mile™ is a must-see shopping and tourism destination! 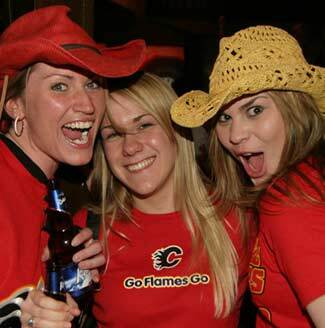 During the Calgary Flames’ amazing 2004 NHL playoff run for the Stanley Cup, and again in 2006, this area became "party central" for Flames fans at numerous bars and restaurants along 17th Ave SW in Calgary, Alberta, Canada. The area continues to remain vibrant as a tourism and shopping destination so come see what else the mile had to offer! Our unique Live Web Cams allow viewers to check out the action along The Red Mile prior to their arrival to the area. We are in the process of adding 10 webcams situated along The Red Mile and other areas of interest for tourists to view and map out their days leading up to the Calgary Stampede. These cameras will be ”adopted” by various merchants along 17th Ave SW.
We will continue to invite Calgary sports fans to converge on The Red Mile to cheer on and celebrate the victories of their favorite sports teams. Stampeder fans, it’s your turn now to share in the fun. But remember, please behave yourselves and respect other people’s property while you celebrate! Shoppers will soon be able to browse hundreds of merchant listings in The Red Mile Red Pages to take advantage of advertisements, specials, and promotions not publicized elsewhere. Patrons will be able to win prizes in-store and on The Red Mile website just for shopping at participating merchants. Coming in the future, shoppers will be able to use The Red Mile VIP Card at participating merchants to receive promotional specials advertised only through this website. AND, weekly prizes will be awarded to VIP cardholders with the winning ID numbers posted somewhere in this site. The Red Mile line of merchandise and collectibles will soon be made available at select local establishments and on-line. Seasonal events like The Red Mile festival, proposed for mid-August each summer, will be showcased here. The Red Mile will further be promoted during high traffic events like the Stampede parade, down at the fair grounds, at tradeshows and conventions, by tourism bureaus and travel agents, in taxi cabs, in movie theaters, and at numerous other venues, all year long, as the ultimate travel destination in Calgary.